the Edgewater neighborhood, just blocks from the Lake Michigan and the CTA Red Line train. 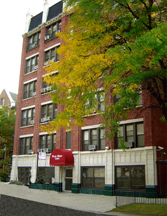 Our facility is located at 5547 N. Kenmore in Chicago. It is a smaller intimate facility providing specialized individual care for adults with mental illness. The facility is near several shopping areas, restaurants and churches. Bryn Mawr Care is licensed by the State of Illinois and is approved for Medicaid, Medicaid Pending and many private insurances. Bryn Mawr Care provides a 24 hour, 7 day a week crisis intervention, assessments as part of our admission service. Our staff of licensed nurses, certified nursing assistants, case managers, consulting psychologists and physicians provide confidential assessments and care plans for psychiatric behavioral problems. Bryn Mawr Care, located in the Edgewater neighborhood of Chicago, provides psychiatric rehabilitation in a residential setting for chronically mentally ill adults, throughout all of the greater Chicagoland area, including, but not limited to Evanston, Skokie, and the North-side neighborhoods of Chicago – Uptown, Rogers Park, and Andersonville.